EASE - Procurement and Inventory management is not only a process it's a dynamic, constantly changing practice that can quickly impact the whole process when the materials are delayed or unavailable. With EASE Procurement, your company can minimise the cost and expenditure through system called proactive procurement management and a level of control that many small and mid-size companies have never been able to experience. 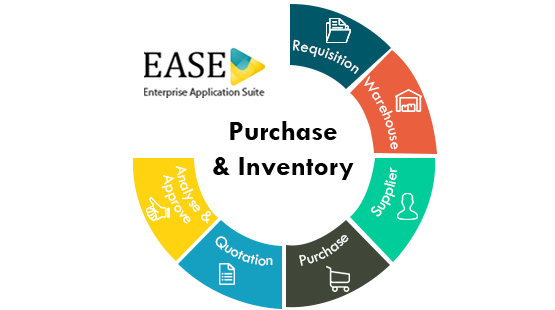 EASE Procurement Software enables advanced inventory and procurement processes. Material Requests from Department / Projects. Chain of Approvals through a predefined workflow for all the requests. Bill of Quantity and Automatic inventory update. Request for Quotation for multiple suppliers. Quotation receipts and price list updating. Stock availability and subsequent stock commitment is performed real-time. If warehoused items are unavailable when requisitioned, the outstanding portion will be automatically filled when re-supply occurs. Disbursement reports identify which items to pull from stock, their stocking locations, and delivery information. Multiple requisitions for similar materials or services can be combined in one order, or a single requisition can be split up into multiple Quotation request/Purchase orders for a number of vendors. Software shows which requisitions are on hold waiting for approval, approved but not ordered, and ordered but not received. Comparing invoices to purchase orders and receipts has always been a time-consuming, paper-based, manual process. Now, with EASE P/I paperless procurement, invoice approvals and purchase order software, you simply enter the purchase order number on Invoice screen. EASE P/I immediately creates the complete invoice from the purchase order program and receipt information already in the system - in a paperless purchasing mode. Individual user of different departments can request items directly. multi-level, approval process prevents items from being ordered prior to all necessary sign offs. Consolidation of business process standardizes the core of business functions by allowing tracking and managing of projects in a more efficient manner, improving maintenance, allowing access and sharing of information among departments, improves effectiveness of planning, decision making and reporting. As a result there will be more effective capture, access and analysis of data. Administrative time is reduced, operational costs go down and data entry errors are nil. Detailed freight and shipping instructions. Set Terms and conditions for the Purchaser orders and manage insurance certifications that, if expired, can be set to block payment. Easily manage multi-national vendors with purchase orders generated and the pricing maintained in their currency.